If you hired someone to care for a person living with dementia you would probably pay close to $20 an hour . Not with this wonderful caregiving tool. He might not look like much in the image. But he is powerful and will provide you with hours of stress free respite. Want some time to yourself? Want to relax? This parrot even allowed me to take a nap without being bothered. I often get asked - how did you do it? One of my most frequent answers - Harvey, the greatest caregiver tool of them all. Many caregivers assume this parrot won't work for them. In almost every case, for over 2,000 readers of the Alzheimer's Reading Room, it worked. You might pay about $20 for one hour of respite care. 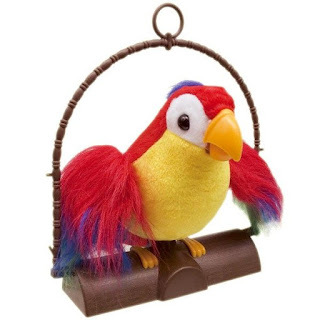 You can buy this parrot for $20. In this one minute video Dotty talks with and interacts with her toy parrot. She also sings a bit. At the time she was 93 years old, and in the moderate severe stage of Alzheimer's disease. By my own estimate this parrot provided me with about 3,000 hours of respite care at a cost of less than one cent (.006) per hour. Here is something I want to make clear. Some caregivers see our Dotty - Parrot videos and run right out and get one. If you are interested in getting one online -- go here. Most are very pleased with the result - it works for them like it worked for me. On the other hand, many Alzheimer's caregivers assume it won't work for them. One of these reluctant caregivers was our own Pamela R. Kelley . In her article,, Pam wrote about about her own initial reluctance to try the parrot. Article - Worth A Try – Surprises Await -- Does the Parrot Work? It’s our intimate knowledge of our loved one’s traits that lead us sometimes to dismiss ideas others offer for ways to enhance daily living with Alzheimer’s in the house. After all, we know what they’re like. That’s how I explain my long delay in trying one of those repeating parrots, like Pete and Harvey. I had listened to the amazing interplay between Dotty and Harvey, and I’d watched the video clips. But I put the idea on the back burner because it simply didn’t seem like something my mother, Audrey, would enjoy. You can read the entire article to find out what happened (click the link above). I was very pleased when we received this comment from Pamela's sister. I just returned from a respite visit with my sister who is also one of your contributing columnists (Pam Kelley). Pam surprised me with PETE the Parrot and I witnessed for myself the fun it brings to our MOM. In fact, our Mom began laughing as soon as she saw PAM holding PETE. It was delightful to see. Then, some real belly laughs followed as we started a little dialogue with PETE. What a great find .... and I thank you for bringing this little miracle item into our family. A reader asked my how or why I decided to try the parrot. Its a long story. Let's put it this way, I had the original toy parrot, now named Harvey for a long time; and then, one day I decided to put him out and see if I could get some interaction out of Dotty. Dotty had been very sick for six weeks, not really there, and couldn't walk more than a few steps. I wanted to get her going again. As soon as I put Harvey out, Dotty started yakking with him. And then, she said to Harvey -- "Harvey, I have a headache". I had asked her that same question repeatedly and she said no every time. Shortly thereafter Harvey was getting all kinds of information out of Dotty. This is when I first decided that Harvey was an Alzheimer's caregiver assistant. Over time, I realized that Harvey was the greatest Alzheimer's caregiver tool ever. Thing about it. When Dotty is sitting in the kitchen I start to interact with her and the parrot chimes in. Then Dotty starts interacting with the parrot and away they go. I can leave the room and go about my business. Let me reinforce what I just said. I could leave the room and go do anything I want to do while Dotty sits there and talks to Harvey. They engage in all kinds of discussion. One of my greatest challenges was keeping Dotty engaged. Well, my boy Harvey kept Dotty engaged for hours each day. Sometimes I had to go back in there and start singing, or talking to get Dotty and Harvey going. As the long term readers know, I have many many podcast and videos on the Alzheimer's Reading Room that include Dotty talking with Harvey, or all three of us talking. You might get magic immediately with the parrot (most do). Or, you might have to help make the magic by facilitating the interaction. Turn on the parrot and start talking. You will have to practice a bit because you have to pause and give him a change to "chime in". If you watch the videos closely you will notice that Dotty learned how to pause and let Harvey get his two cents in. Harvey entertains Dotty (and me). He talked with Dotty. He helped keep Dotty's brain working. He provided needed socialization and discussion. Instead of sitting around like bump on a log, Dotty had Harvey. Yes, Dotty at times thought Harvey was a person (she knew he was not). Dotty did tell Harvey she loved him, and I heard her say he was her "best friend". Believe it or not persons living with dementia do get lonely when everyone fades away. You want some rest? You want some respite? You wanna laugh? Feel good? Consider getting a repeat parrot. Please remember, if you hired someone to care for a person living with dementia you would probably need to give them some instruction or maybe even training. So when you get your repeat parrot you might need to work with him (or her) for a while. Harvey costs less than 20 bucks, and works for free from that point on. Dotty first met Harvey after her short term memory was long gone. So there can be only one explanation why she remembered him - a strong emotional attachment with him. Bob DeMarco., Alzheimer's Reading Room, 2017, "The Best Alzheimer's Caregiver Tool of Them All, A Must Have for Every Caregiver"